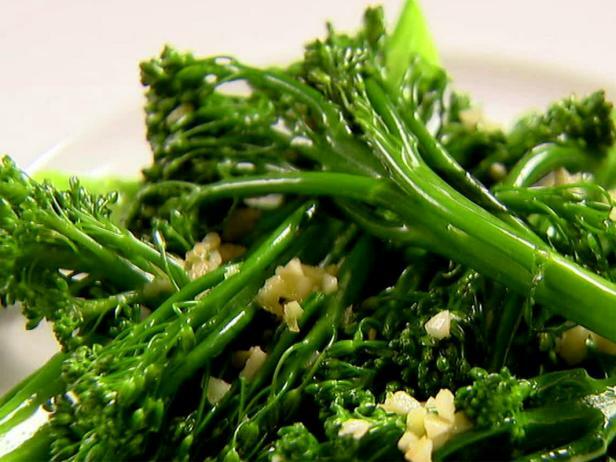 Broccolini is sometimes called "baby broccoli," however, it isn't broccoli, but it is a cross between broccoli and Chinese chard. Brocollini is sweeter, has more tender stalks than broccoli, and cooks faster. Don't over cook - keep it crisp tender for the best flavor. In a large pot, bring 8 cups of water and the salt to a boil. Remove and discard the bottom third of the broccolini stems. If some stems are very thick, cut them in half lengthwise. When the water comes to a full boil, add the broccolini, return to a boil, and cook over high heat for 2 minutes, until the stalks are crisp tender. Drain and immediately immerse the broccolini in a large bowl filled with ice water to stop the cooking. Drain in a colander and set aside. Heat the oil in a saute pan. Add the garlic and cook over low heat, stirring occasionally, for 1 to 2 minutes. Add the broccolini and stir until heated through.